As an Oncology specialist, Dr. Vu provides a comprehensive and individualized approach to cancer management specifically tailored to each patient's needs. Dr. Vu is the best Dr. to have in such a high volume area that serve so many cancer stricken patients. His positive attitude, his compassion, and his medical knowledges, makes him the person who listen and discuss any issue that you may have. He is very knowledgeable in the causes and treatment of the disease.. I thank God for him and Kelsey for bringing him in to this critical area.. Excellent manner. Thorough. Pleasant and professional. I like Dr. Tri Vu: He is very professional and respectful. He allows me to ask questions about my situation and will explain as much as possible. He always will explain our path forward in every situation. I am always comfortable visiting with him - he treats me like a human being. Dr. Vu is an excellent doctor! Explains everything carefully and in a way easy to understand! He seems to care a lot about his patients! Dr. Vu was my post breast cancer Oncologist back in 2013. I have recently returned to his care. He is knowledgeable, answers all questions thoroughly and does not rush through your appointment. Dr. Vu is approachable and very friendly. I would recommend him highly. Health care will inevitably change, but I know the care I get from Dr. Tri Vu and his team will always be exceptional. Dr. Vu has world credentials, sincere manner, and a can do attitude. 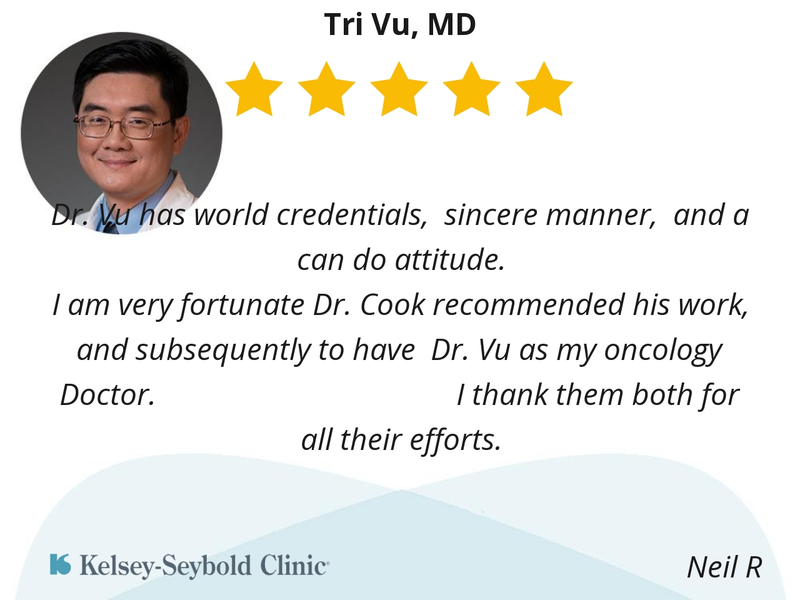 I am very fortunate Dr. Cook recommended his work, and subsequently to have Dr. 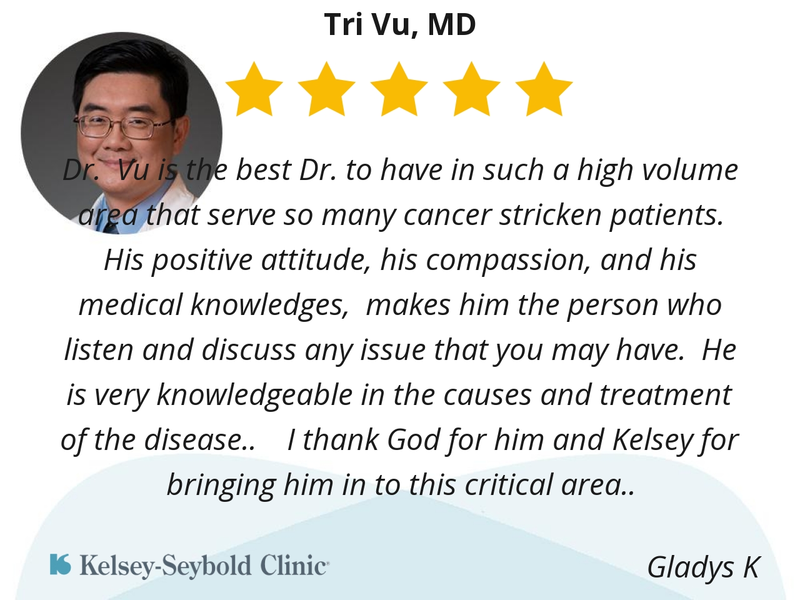 Vu as my oncology Doctor. I thank them both for all their efforts. gives understandable explanations and covers all the bases. Excellent doctor! Answers all questions clear and concise. Highly recommend! My father saw another oncologist in your group in June 2017. She told him he would be dead by Dec. 2017. We sought a second opinion from Dr.Vu and my dad is still here, a year later, enjoy a high quality of life. Dr. 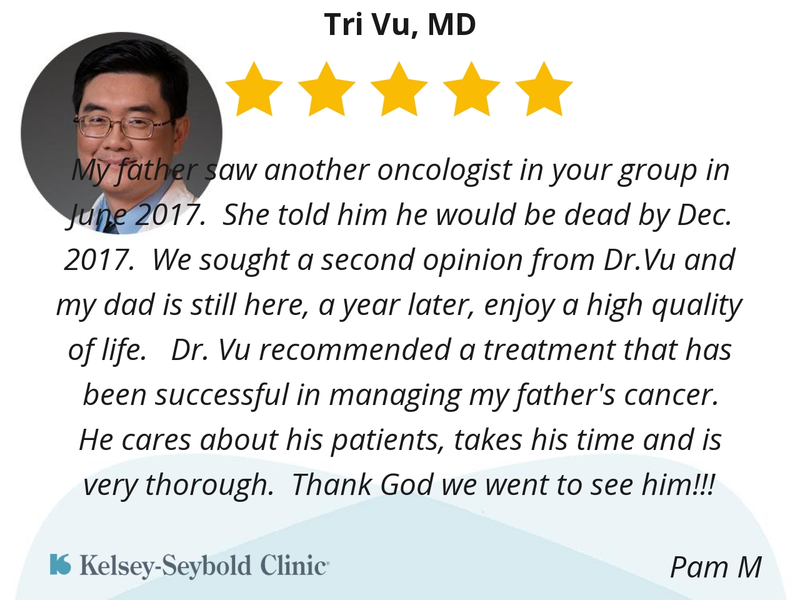 Vu recommended a treatment that has been successful in managing my father's cancer. He cares about his patients, takes his time and is very thorough. Thank God we went to see him!!! Dr. VU, explains and answers questions. So that, I can understand the diagnosis, test. Etc. Dr. VU is professional and thorough. I know that Dr. 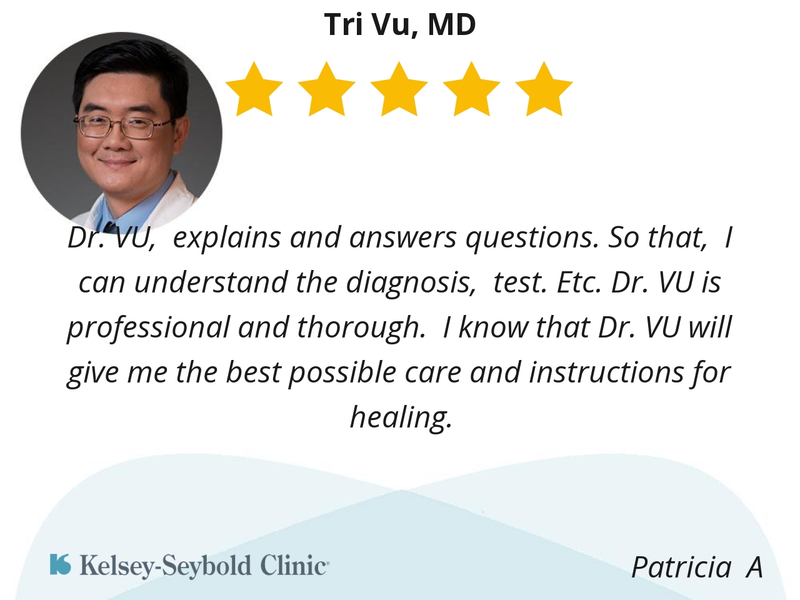 VU will give me the best possible care and instructions for healing. I liked Dr. Vu because he was a great listener and very carding.